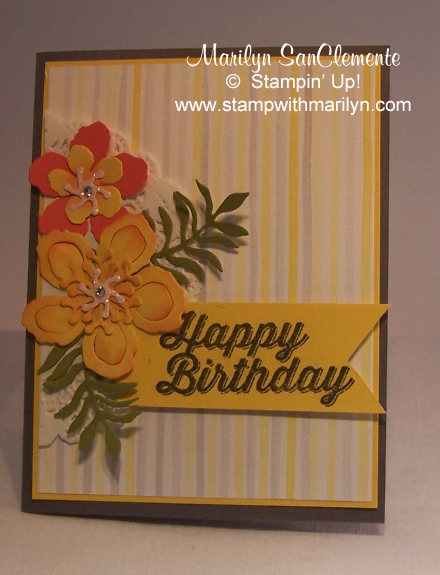 Marilyn SanClemente March 2, 2016 March 2, 2016 All Occasion Card, All Occasion cards, Birthday, Stampin' Up! Today I have a Botanical card that is inspired by this week’s Global Design Challenge which is a color challenge. I happen to love the combination of Yellow and Gray. So I went through my stash of Stampin’ Up! Designer papers to see which patterns had Daffodil Delight. I found this Watercolor Wonder Designer paper from Spring a few year’s ago. So the details on this card. 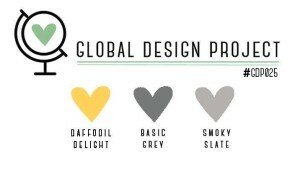 The card base is Basic Gray with a layer of Daffodil Delight cut to 5 1/8″ x 3 7/8″. I cut the designer paper to 5″ x 3 3/4″. Next is a Lace Doily that has been cut in half. I lined the doily up with the edge of the Watercolor Wonder Designer paper. 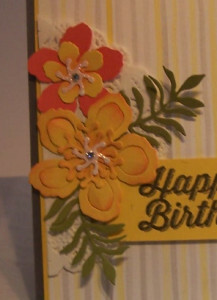 The flowers are cut from Daffodil Delight and Calypso Coral cardstock. The Daffodil flower has been sponged with Calypso Coral Ink to add a little depth to the flower. I cut a flower center from Dazzling Details Glimmer paper and sponged that with a little calypso coral ink as well. The I added a Rhinestone Jewel to the center of the flower for that little extra bling! The fern leaves are cut from Old Olive cardstock. The Birthday Banner is stamped using the Perfect Pairings Sale-a-bration stamp set on a 1 1/2″ x 3″ piece of Dafflodil Delight cardstock. The Happy Birthday is stamped with Basic Gray ink. Marilyn, I love the unexpected pop of color added to this color combo. The background is great too! This card is great. Thanks for joining us for our color challenge this week at Global Design Project. A great card with a pop of colour. Thanks for taking inspiration for us at Global Design Project. I SOOO loved this yellow and Smoky Slate paper – and I love what you’ve done with it here. Fun to see it paired with the flowers. Thank you so much for playing along with this week’s color challenge at the Global Design Project.